When driving at 25 mph (40 km/h) or above: Take your foot off the pedal and press down the RES/+/SET/– switch when you reach the desired speed. The moment you release the switch, the set speed is fixed, and ACC with LSF begins. When driving at slower than 25 mph (40 km/h): You can set the vehicle speed only when there is a vehicle detected ahead of you. If the vehicle is moving and the brake pedal is not depressed, pressing the switch fixes the set speed to 25 mph (40 km/h) regardless of current vehicle speed. If the vehicle is stationary, you can set the vehicle speed even with the brake pedal depressed. When ACC with LSF starts operating, the vehicle icon, distance bars and set speed appear on the multi-information display. When the MAIN button is pressed, ACC with LSF and Lane Keeping Assist System (LKAS) are both turned on or off. Do not use ACC with LSF under these conditions: • In poor visibility (e.g., bad weather, such as rain, fog, and snow). • When you must slow down and speed up repeatedly. • When you enter a toll gate, interchange, service area, parking area, etc. 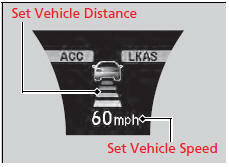 In these areas, there is no vehicle ahead of you, but ACC with LSF would still try to accelerate to your set speed. • On a slippery road (for example a road covered with ice or snow). • When a spare tire* is installed. • When going down a steep hill where the engine braking does not work sufficiently. You can switch the displayed set speed measurements on the multi-information display between mph and km/h.